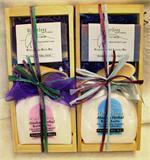 Gift Sets with full sized products, made by us! Full sized Rainforest Mist, Outdoorsman, and Sitka Spruce soaps tied on a custom wooden tray. Full sized Wild Alaska Rose, Forget Me Not, and Fireweed Honey soaps tied on a custom wooden tray. Full sized Glacier Blue, Alaska Seaweed, and Fisherman's Scrub soaps tied on a custom wooden tray. Full sized Wild Alaska Rose, Rainforest Mist, and Wild Berry soaps tied on a custom wooden tray. Full sized soap, 4 ounce lotion, and 8 ounce bath salt tied on a custom wooden tray in 12 different scent choices. Full sized soap, 18 ounce bath salt, and bath salt scoop nestled into a custom wooden crate tied with coordinating ribbon. Full sized Devil's Club soap and salve packed in a clear box and tied with ribbon.